About - Bluegrass Thoroughbred Services Inc.
Our goal is to provide our clients with the piece of mind that their interests are carefully managed and always put first, no matter their level of experience or personal involvement in the stables operations. We pay careful attention to management of our clients risk exposure via careful attention to each horses development, market value and progress toward the goals set out for both the individual and the stable. Please call or write, if interested in learning how the team at BTSI might be able to assist in the management of your own bloodstock interests. Peter G. Schiff, President of Northwood Ventures, owner and operator of Fox Ridge Farm, Inc., which breeds horses to race in New York, and member of NYRA and The Jockey Club. ​ John became involved in horseracing in his youth, riding steeplechase races and assisting his mother in reconditioning Charles Town racehorses for futures as hunter/jumpers. After graduating from UVA, his enthusiasm for horseracing led him to a career in Kentucky, where he and fellow Virginian Peter Bance founded BTSI and began advising several racing outfits. Soon enough BTSI would become part owner and manager of its own racing partnerships, our most recent have enjoyed considerable success- Yorktown LLC achieved 52.7% ROI over 2.5 operating years & M2 racing has developed black type status for seven of its twelve race fillies, ensuring profitability for the LLC. circuit, allowing us valuable relationships with top trainers capable of delivering top class results. Charles D. Miller, the retired CEO of Fortune 500 Company Avery Dennison, retired shortly after a visit to see Silver Charm win the 1997 Kentucky Derby, at which time he also visited some Kentucky farms with John Stuart. After joining in two profitable racing partnerships managed by BTSI, Chuck decided he wanted to own a few racehorses of his own. He wanted residual value and to participate at a high level - and has he ever! His four-filly stable, three of which were purchased privately by BTSI, includes PROSPECTIVE SAINT, 2nd in the Gl Princess Rooney and a multiple stakes winner originally, who was purchased in a Maryland 2yo sale for $40,000. SOMETHINABOUTLAURA, owned in partnership, won the 2006 G2 A Gleam Invitational at Hollywood Park after being purchased out of the February Mixed Sale at Fasig-Tipton Kentucky. POTRA CLASICA (ARG), originally purchased in Argentina for $50,000, has won three Calder stakes, including the $150,000 Hollywood Wildcat. 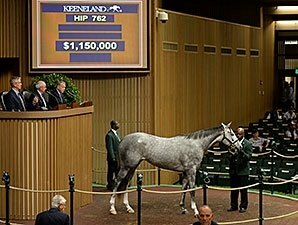 SILVER HIGHLIGHT, was purchased as a maiden and won the $250,000 Wonder Where S. at Woodbine in her first North American start. See what is coming up in the next consignment from Bluegrass Thoroughbred Services. Let us help you plan your next breeding. See the success of Bluegrass Thoroughbred Services sales graduates.